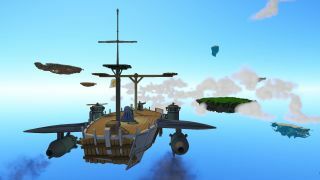 Bossa's airborne MMO Worlds Adrift underwent its first alpha playtest in November, and the trailer that resulted was pretty exciting—not so much for the gameplay it put on display, as for its obvious potential. The Improbable technology that powers it, if it pays off as promised, will enable all sorts of physics-based gameplay that has thus far been impossible to achieve, and so while it's very early days right now, Worlds Adrift could herald some very big changes coming our way in the relatively near future. At less than two minutes long, the trailer from last week naturally shows the game at its current-state best. An unedited look at what's cooking is now available on Twitch, in the form of a playtest that was streamed earlier today and is now available for rebroadcast. It's a much meatier chunk of video, clocking in at a hair over two hours (although it takes about 15 minutes for things to get started), narrated throughout by Bossa's Colm Ahern and Oliver Age 24, who are actually just watching other people play the game via the spectator mode. It's a lot to sit through, especially since there's not always a lot happening, but it's nice to have an unvarnished look at a game that's making some awfully big promises. Bossa isn't currently taking applications for upcoming playtests, but if you'd like to be notified when the doors re-open you can sign up for "exclusive access" at worldsadrift.com.